At sixth level small golden pillars appear on the sides of the Town Hall with vines that partially cover them. At Sixth level the Town Hall has 2,800 , the upgrade cost is 750,000 and last for 4 days. After finishing of the upgrade You will get the Experience: 587 . 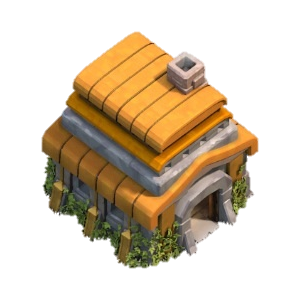 At this Level the Town Hall can store the following maximum amount of Resources: 300,000 and 300,000 . 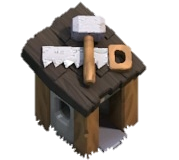 Sixth level of the Town Hall allows you to build 8 additional Buildings (Total is 53, including the Town Hall itself, Traps and 5 Builder’s Huts). The number of available sections of the Walls is increased by another 25 (Total is 125). The most expensive upgrade for Elixir at this town hall is Lighting Spell level 4 for 1,000,000 . The most expensive upgrade for Gold is Clan Castle level 3 for 800,000 . Now you can upgrade the lightning spell to level 4 on town hall 5 for 1M gold. It is very nice comment. What about the new update with 2 air defences?